ChapStick is back with an exciting variety of seasonally-inspired, limited-edition products to keep lips looking and feeling mistletoe ready throughout the holidays. This year's offerings include a variety of fan favorites and unique package types, featuring: Pumpkin Pie, Candy Cane, Cake batter, Gingerbread Kiss and the Original Lip moisturizer. But don't forget these are only available for a limited time! The elves at Wrapped Up N U were thrilled to work with ChapStick this holiday season. We received these two products below to help us keep the season merry, bright and unchapped. These items make great stocking stuffers at a very affordable price. 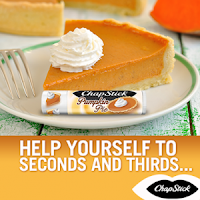 With the changing of the seasons, we all could use the added protection that ChapStick offers. ChapStick offers a wide variety of products and flavors that are sure to be on everybody's wish list...even Santas! teachers. A guilt-free way to enjoy a fall favorite. 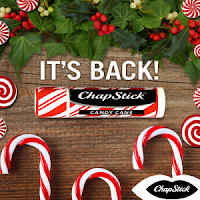 Limited Edition ChapStick® Candy Cane is back! ChapStick® Candy Cane is available through the holiday season exclusively at Walmart, Walgreens, Target, and CVS. 1 count loose sticks are sold for an SRP of $1.00 to $1.99 at Walmart and Walgreens and 3 count packs are available at Target, CVS, and Walmart for an SRP of $2.99. A disclaimer and disclosure: * We received these product in exchange for a review. We were compensated with product for our reviews, however, all our opinions are our own, based on our personal experience with the product. We are disclosing this in accordance with the Federal Trade Commission’s 16 CFR, Part 255: Guides Concerning the Use of Endorsements and Testimonials in Advertising.